In 12-inch skillet, melt butter over medium heat. Cook onion and mushrooms in butter 8 to 10 minutes, stirring occasionally, until onions are tender and beginning to brown. Stir in sugar. Cook about 3 minutes, stirring occasionally, until vegetables are very brown. Stir gravy and sherry into vegetables. Add chicken to skillet; spoon sauce over chicken. Cover; cook 5 to 10 minutes, turning chicken after half the cooking time, until thoroughly heated. Sprinkle with parsley. If the chicken is cold or cut into quarters, the cook time to heat it will be a bit longer. 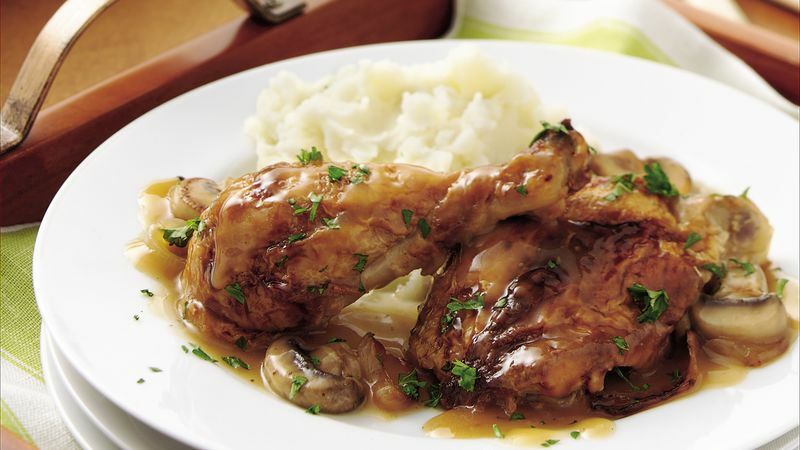 Serve this tasty chicken dish with Roasted Garlic Mashed Potatoes (p. 86) and buttered broccoli spears.